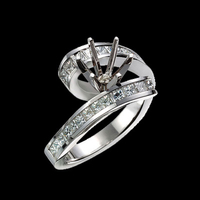 Platinum Fancy engagement semi mount ring, 1/5ct tw baguette diamonds. 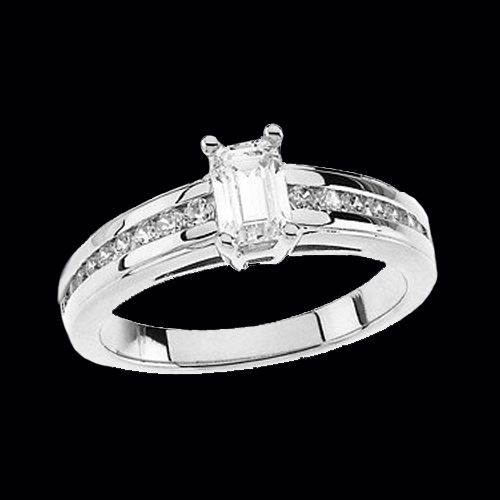 Also available in a similar Princess cut diamond style, diamond weight 3/8ct tw. Very pretty ring, shown with a 1ct tw center email for a price list. Lovely Platinum 3 stone princess diamond engagement ring. This ring is set with 7/8ct tw SI2 clarity G-H color diamonds. Center diamond is a 3/8 stone, .37ct. Platinum ring weighs 8.69grams, a very nice ring. Incredible Platinum Emerald cut diamond engagement ring. 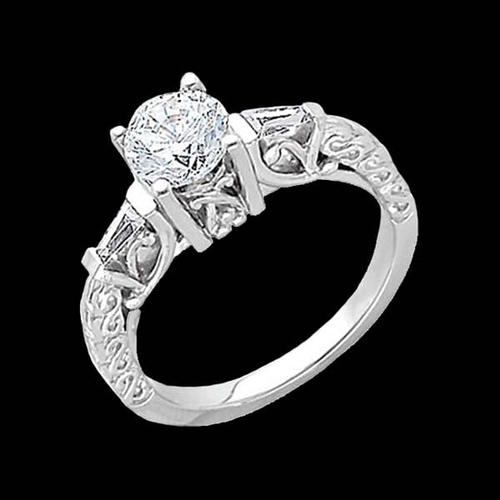 Diamonds are channel set in this clean, crisp engagement ring design. 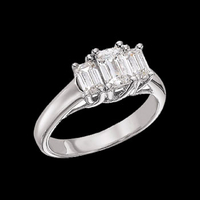 Center emerald cut diamond is a VS clarity G-H color 1/2 carat diamond, channel set diamonds total approx. .28ct tw. Platinum ring weighs 8.43grams. This Incredible Platinum Semi-Mount has Blue Sapphires on either side of the center diamond. 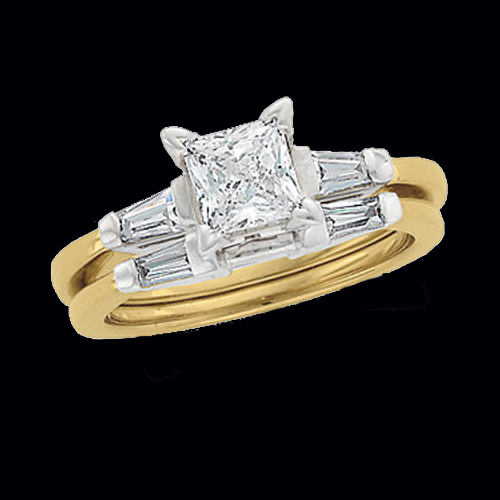 Order this with or without a Certified Center Stone. This fabulous platinum hand engraved ring weighs approx.. 855grams. We have a large inventory of conflict free diamonds. 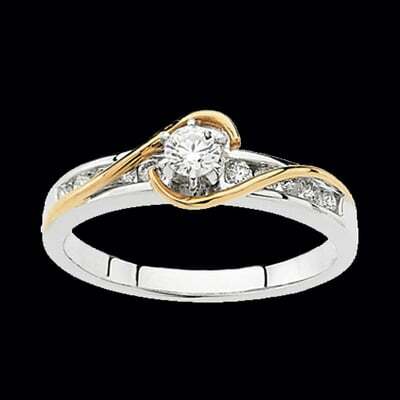 14K Gold Engagement Ring with Matching Band. 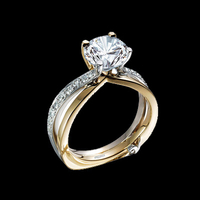 Diamond weight on the engagement ring is 1/3 carat and an additional 1/2carat center, band diamond weight, 1/6ct tw. Great price is for the Complete engagment ring with the matching band set with SI 2 clarity G-I color diamonds. 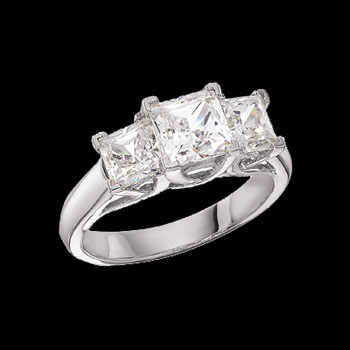 Tantalizing 14k white gold channel set princess cut diamond engagement ring. Incredible modern design features a bypass style with 1.02ctw princess diamonds. 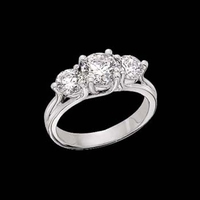 We have hundreds of round diamonds that would look perfect in this diamond engagement ring. Shown in 14k white gold this ring is also available in 14k yellow gold, 18kt gold, or Platinum. Pretty 14K Gold Marquise Center Wedding Set. Diamonds weigh .65ct tw including the center stone and are SI quality G-I color. Lovely design. 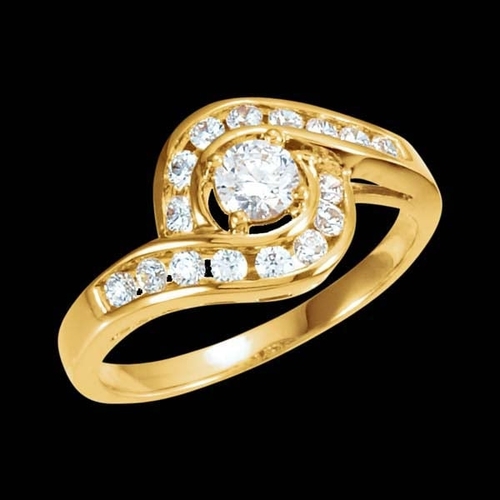 Beautiful 14k Two Tone gold diamond wedding ring. Diamonds are channel set in this great design and total 1/3ct tw. The center diamond measures 3.4mm round and is .15ctw. Matching band shown and available at an additional cost. Brilliant diamonds in this set are SI 1 clarity G-I color. Gorgeous 14k Two Tone gold Princess cut center diamond wedding set. Center diamond is a 1/2 carat SI 2 clarity G-I color diamond. Additional accent diamonds total .35 ct, are baguettes and SI 1 clarity G-I color. Stock size 6. Free sizing just add size to comment box at checkout. 5-7 additional days for sizing. Our price is for the engagement ring, matching band is sold separate. 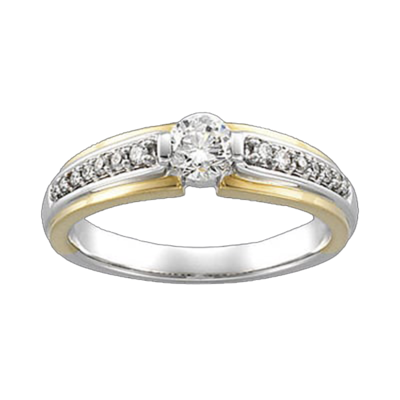 14k Two Tone gold Retro-Style engagement ring and matching band. Engagement ring is set with a .25ct SI 2 clarity G-I color round center diamond. Two accent diamonds total .14ct. Matching band is set with .37ct diamonds. Very classic wedding set. Pretty 14k two tone gold diamond engagement ring. Diamonds set in white gold on either side of a center diamond (not included) total .26ct tw and are SI 1 clarity G-H color. 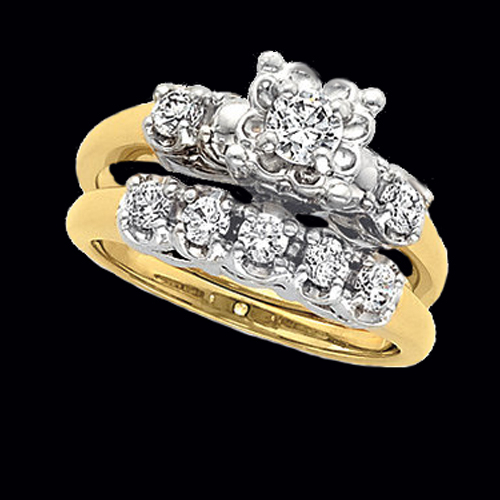 We have an incredible collection of round diamonds perfect for this rings center.